NEW YORK – The word suggests compassion, benevolence. It even sounds nice. Mankind needs more of it. But in the financial world, there may be far too much already. Goodwill is the accounting term for the premium that companies pay when they buy each other, over the value of the actual assets being purchased, such as factories, products in a warehouse and office equipment. Goodwill is the value placed on the intangible, special something about the company being bought – its reputation, perhaps, or its skilled workforce or corporate culture. Yes, it’s that vague, that subjective, that iffy – and investors don’t really mind, except when it goes bad. If a deal doesn’t work out, all that goodwill is worth less, and the earnings of the combined companies can be cut deeply. Thanks to a wave in corporate deals over the past few years, the amount of goodwill sitting on balance sheets of companies in the Standard and Poor’s 500 index has ballooned to $2.5 trillion. That’s 50 percent more than at the end of the last deal boom in 2007, according to FactSet, a data provider. Goodwill now accounts for 8 percent of all assets in those companies, a percentage point more than in 2007. Some experts think a hit to earnings is almost inevitable. “We’ve got lot of goodwill because companies are buying at ridiculous prices,” says Roger Martin, a professor and former dean of the Rotman School of Management at the University of Toronto. Others aren’t so sure, but they’re still concerned. The history of mergers and acquisitions is not encouraging. In the 12 months following the end of the 2007 deal boom, write-downs of goodwill reduced S&P 500 pretax earnings by more by 38 percent, according to data provided by R.G. Associates, a research firm that specializes in accounting issues. In 2002, following a similar surge in acquisitions, write-downs cut pre-tax earnings by 21 percent. Some recent deals have not left much wiggle room for things to go wrong. In June, Microsoft offered $26 billion for LinkedIn, the professional networking service. That’s about six times higher than LinkedIn’s book value, a way of valuing a company’s assets by how much they could be sold for fast. By comparison, investors buy and sell technology companies on the stock market for about 4.1 times book value. The deal looks pricey by other measures, too. The price Microsoft is offering is 50 percent more than what investors had judged LinkedIn shares were worth before the deal. 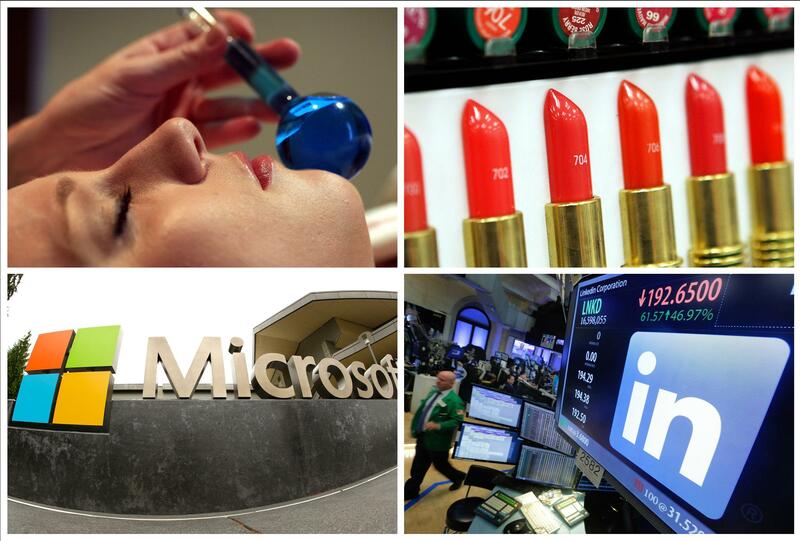 Revlon’s $419 million purchase of Elizabeth Arden announced a few days after the Microsoft news is 50 percent more than the target company shares, too. By contrast, the $22.3 billion offer by Oreo maker Mondelez for Hershey announced on Thursday was just 10 percent higher than what Hershey’s shares had been trading for. But that offer is an exception to the trend, and Hershey rejected it anyway. The average premium over share prices offered by buyers last year, a record year for deals, was 38 percent, according to Dealogic. That was higher than the long-term average, and came on top of shares already highly valued. In 2007, when shares were as expensive as they are today compared to long-term earnings, buyers offered 27 percent premiums, 11 points lower. In some industries, premiums have soared. Health care companies last year were offered 57 percent more for their shares in acquisitions. Goodwill in the industry is now $242 billion, double its level just five years ago. If these companies had to cut that goodwill by just 10 percent, it would slice about a quarter off their annual pretax earnings. As U.S. companies shift from making things to offering services, it’s only natural that goodwill has increased. The value of many companies resides now more in the knowledge, experience and skill of workers than in the machines on their desks or in their factories, assuming there are any factories. But more goodwill doesn’t mean anyone has a better sense if it’s been properly valued. The bad timing of many deals makes goodwill suspect, too. Companies tend to buy other companies when stocks are soaring and are expensive, and goodwill from the deals is high, then pull back after stocks have crashed and there are bargains aplenty. They should do the opposite, of course, but the mistake is understandable. If companies like to use cash or stock to buy, they will be tempted to wait until the economy recovers and both have risen. For those that like to borrow, it’s easier and cheaper to do so then, too. Psychology also plays a role. Like ordinary investors, CEOs like to buy when everyone else is buying because they crave the safety of the crowd, says University of Toronto’s Martin. They tend to ignore the bad deals, dismissing the write-downs as one-time events that don’t impact the future, says R.G. Associates’ Jack Ciesielski, an accounting expert and longtime editor of the Analyst’s Accounting Observer, a newsletter. But they do impact the future, he argues, because it means CEOs can make bad deals again without worry. Published: July 1, 2016, 11:17 a.m.